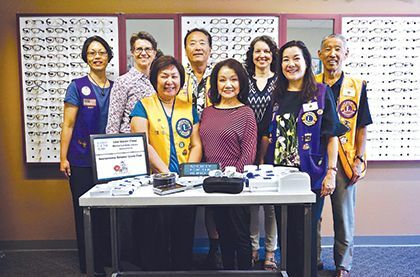 SACRAMENTO REGION, CA (MPG) - Society for the Blind received a $10,000 grant from the Sacramento Senator Lions Club to fund a device lending library in the organization's Low Vision Clinic. The lending library will allow patients to borrow low vision devices such as hand-held magnifiers and portable electronic devices to determine if they are a good fit. These devices enlarge text or convert text to speech so people with vision loss can continue to read. Society for the Blind operates a full-time Low Vision Clinic in Sacramento and a satellite office in Roseville. It is one of the longest running community-based clinics in the region. The Low Vision Clinic provides care, vision rehabilitation, low vision devices and transportation assistance to more than 375 people each year. Clinics are staffed by three optometrists with special training in low-vision eye care and serve patients with cataracts, glaucoma, age-related macular degeneration, diabetic retinopathy and other congenital and degenerative eye diseases. Clinic staff includes an occupational therapist who works with patients with some functional vision, teaching them techniques to use their remaining vision safely and effectively and providing training on assistive devices. The Sacramento Senator Lions Club was chartered in Lions Clubs International in 1954. The Senator Lions Club belongs to District 4-C5 and resides in the Crocker Zone of the Sacramento Region. The club participates in local community service projects including sponsoring the UC Davis Children's Hospital; providing meals, toys and clothes to the needy via their Salvation Army partners; sponsoring the Sacramento Zoo's Sensory Garden and Fairytale Town's Japanese Garden; and more. To learn more, visit SacramentoSenatorLions.org.